Since 1998, DJ Glow from Vienna has been running a label that has trust in electro. After all the years, TRUST’s catalogue can’t called extensive but the label is putting out records at a steady pace and the lineup speaks for itself, with artists like Microthol, Epy or Clatterbox and a number of mini compilations from recent times. In 2003, Lok44 debuted on the label with “Ghetto Of The Mind” and after “Derailed” in the following year fell silent for a long time. Till now I was not aware about the background of the act that was so far spotted in my collection only with a remix for Dan Lodig’s and Orlando Voorn’s “The Split”. The answer was in the previous sentence, because the alias belongs to Daniel Lodig, an Austrian producer of rare appearances but still a grey eminence of the European techno. He is co-running Pomelo, another seasoned label from Vienna, which is showing new elan this year and has announced for September an EP with Lodig’s sounds. By the way, Lodig’s debut release from 1995, a double pack on Tension Records titled “Che Si”, is one of my favourite techno albums of that decade. 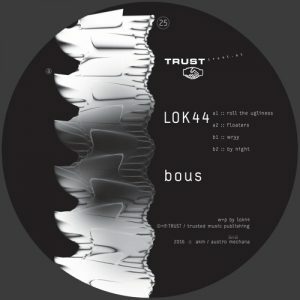 “Bous” affirms that for Lodig the quality goes over the quantity, as the Austrian has succeeded in collecting immersive electronic sounds for his new EP. The opener “Roll The Ugliness” is heavily loaded with techno bass and in the same contains elements of melodic electro. Things get more varied in “Floaters” that is driven by ample chords and lustrous arps in the borderline of IDM and deeper Detroit techno. The B-side shows again a different angle when “Wryy” launches with bass tremors that merge with the sterility reminding of Kraftwerk’s “Aerodynamik” and “By Night” is a shady tune with grimy vocals for the nights of living bass. TRUST is not standing still because for September the label has announced Versalife’s EP “Self-Replication”.